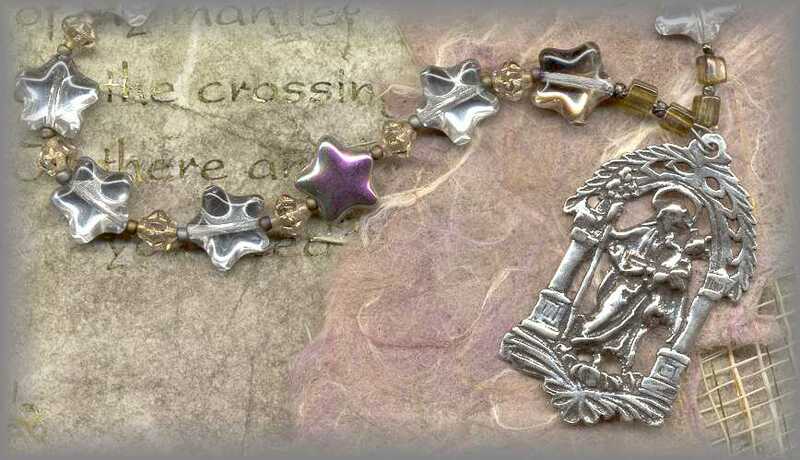 These 4 beautiful chaplets or little crown of 12 stars are inspired by two passages in Revelations.Also see the link for the very powerful prayer response and meditation (bottom of page) for Rev. 22. A beautiful opportunity to find peace in times of illness and death. the 'woman' is with us from the first book to the last! 5 When he calls them, they answer, "Here we are!" him and shine for joy, just for him! 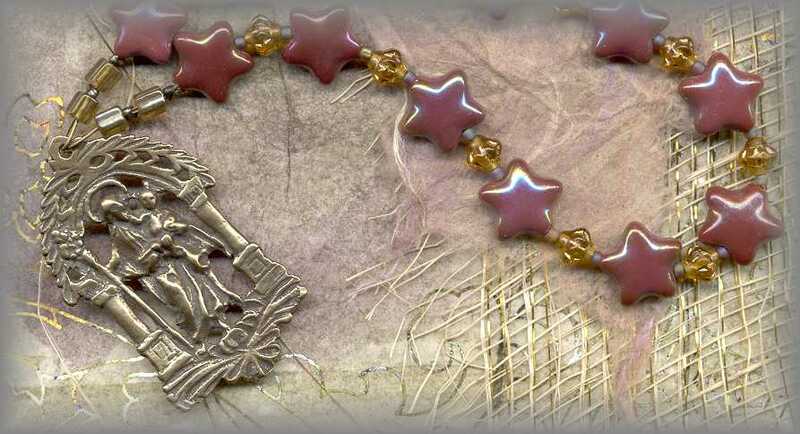 also known as the "little Crown of Stars"
Gate of Heaven' is one of the titles of Mary (Litany of the Blessed Virgin Mary). The antique medallion from 19c Spain shows Joseph who is holding the Child Jesus and a staff of lilies. He is standing in - embraced by - the 'Gate of Heaven.' A beautiful, symbol of the Holy Family. And a powerful devotion for you and your family. The power of Revelations 22 never ceases to touch those who read and pray it. It has been especially powerful for the terminally ill - or for the loved ones of those who are dying. (It was given to a guild member as a 'response' or 'dialogue' prayer shortly after the long suffereing death of her husband of 39 years.) But we do not have to be ill to gain strength from these words. Great peace comes from praying, meditating and responding to each of the verses in 22. They remind us of how we must never lose site of our eternal destination - home to the heavenly Jerusalem. And to be aware that Mary is here to take us to her son, Jesus, our Beloved.